Compact in design, robust in power, the Nx’s smooth, quite operation is ideal for a wide variety of applications ranging from auto body shops to light industrial. 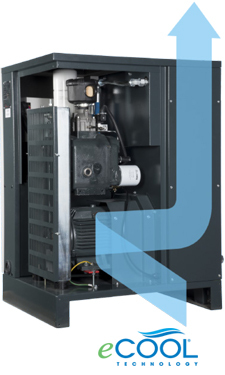 A Cool Innovation Compressors generate heat. FS-Curtis’ exclusive eCOOL technology provides protection from heat and reduces thermal stress. By combining smart compressor layout with intelligent component selection, eCOOL technology maximizes cooling airflow for greater energy efficiency, improved reliability and increases service life up to 50% longer for motors and electrical components and up to 30-50% longer for bearings, hoses and seals. Downstream oil and water can make a negative impact on your bottom line. The Nx series compressors also have an optional Ultra Pack which includes an integrated dryer and filter to keep your production high and your air system dry. Downstream oil and water can make a negative impact on your bottom line. The Nx series compressors also have an optional Ultra Pack which includes an integrated dryer and filter to keep your production high and your air system dry. FS-Curtis is dedicated to providing industry leading warranty programs. These warranties provide additional peace-of-mind to products which already enjoy best-in-class quality. All FS-Curtis NX products are backed by a Standard Manufacturers Warranty of 12 months. The NxGEN warranty program detailed below can provide added protection. To participate in the NxGEN Warranty Program the requirements listed below must be performed and documented throughout the full warranty period..
All Rotary Screw air compressors are required to have the “start up” procedure completed by and authorized FS-Curtis distributor and returned to FSCurtis within 30 days of the compressor package start-up. 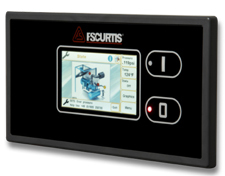 Please email the completed check list to warranty@fscurtis.com. Form# WRSC-002. The NxGEN Extended Warranty Program requires the Nx product to be registered at http://info.us.fscurtis.com/support/warranty/register.htm. A minimum of one Annual Service Kit must be purchased on an annual basis, which is defined as 12 months. The Annual Service Kit should be purchased within 60 days prior to the anniversary date of the compressor package start-up date. Individual genuine parts and lubricants as specified in the service manual can be purchased. Nx products must be maintained in accordance with the maintenance schedules provided in the service manuals for the appropriate service interval using only FS-Curtis genuine parts and lubricants for the entire warranty period. Proof of purchase (i.e. product invoice) will be required in the event a warranty claim is filed and these purchases must correlate with the recommended maintenance guidelines in the service manual for the corresponding operating hours of equipment. Participation in the FS-Curtis oil analysis sampling program is required. An oil sample must be sent to our testing facility at minimum two times a year which is defined as 12 months or once every 6 months. Any recommendations detailed in the analysis report must be followed as outlined in the report. Oil sample kits are available upon request. The use of FSC-8000 lubricant is required. The lubricant must be changed as per the service manual intervals, oil analysis recommendations or at minimum every 12 months. Oil filter and separator must be replaced at the time of the lubricant change. ALL OF THE ABOVE REQUIREMENTS MUST BE PERFORMED AND DOCUMENTED TO ENSURE THE NXGEN WARRANTY PROGRAM IS IN EFFECT FOR THE FULL WARRANTY PERIOD. FS-Curtis reserves the right to change the extended warranty program and/or requirements as deemed appropriate by the company.FS-Curtis reserves the right to refuse participation in the extended warranty program to any distributor and/or end customer of the compressor. With the optional iCommand-Touch, a full-color screen displays graphs which capture and track factual, real-time air usage by the hour, day, week and month. Historical data can be retrieved at any time at the touch of the screen. Data trending keeps your finger on the pulse of your entire compressed air system. Continously tracks pressure, temperature, air quanitity and usage to easily diagnose and optimize your plant’s air system.